The DFS_FILE_SYSTEM Blue Screen of Death Error is a critical and fatal error which is normally caused by an unstable system registry. The error also occurs when a system file that is supposedly required to run the software is corrupted or damaged. One can be aware of the error’s presence due to a lot of program lock ups, slow computer performance, frequent error messages, the system not responding, slow boot, and hardware malfunction. Scanning for viruses is important in fixing this error. 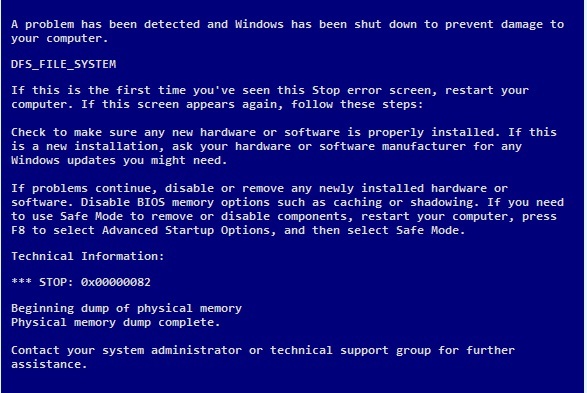 Some DFS_FILE_SYSTEM errors are caused by viruses that are overlooked by an existing firewall or anti-virus software. Update the currently installed anti-virus software in the system or download a legitimate and most recent version of an anti-virus and immediately perform an overall scan to all the programs and applications installed in the computer. After an hour, the program will show the errors and malfunctions present in your computer. Remove the corrupted programs and restart the PC. In fixing the error in a more automatic manner, use an Emergency Repair Disc (ERD); this works under the premise that an ERD was created before errors in the system surfaced. To proceed, first remove the hardware and check its compatibility with the Microsoft Hardware Compatibility List. Then re-check the system requirements for the operating system. If the warning signs continue to appear, use Last Known Good option in the Windows Advanced Options to create a dump file. Configure the entire operating system when the warning messages still appear and perform the configuration using an Emergency Repair Disk. This particular process usually takes an hour and thirty minutes to complete. Like previous scans, it will bring the results of software malfunction. Immediately perform the required task, delete the remaining corrupted programs and applications and restart computer. If the computer is not started up properly, call the dealer where the whole computer is purchased and ask for newer and more updated versions of hardware drivers. Another means to fix the error is to use a repair tool; PC Reviver is an example. Secondly, get the updates for the DFS driver and install the latest updates of the software. To manually install the latest updates, use the Internet Explorer or any web browser available and follow the instructions provided. Restart the computer.